Tags: 60cm, Black, Ceramic, Hob, Touch Control. 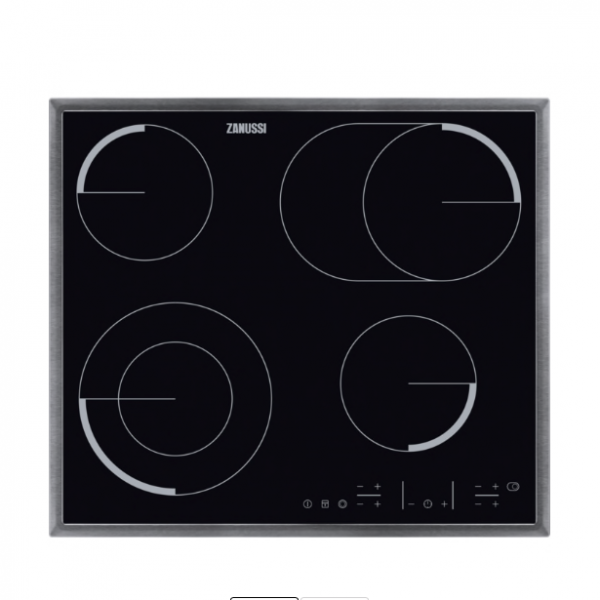 Cook with confidence with the Zanussi ZEV6646XBA Electric Ceramic Hob. With clever easy-touch controls and a digital display, it’s quick and simple to set your hob to the correct heat setting. The residual heat indicator lets you know if the surface is still hot once you have finished cooking, so you can minimise the chance of any accidental burns. With the oval shaped multi-purpose cooking zones, you will never need to move your pan around or stand by the hob stirring to ensure everything is evenly cooked. Heat pans of all shapes and sizes with confidence that everything is cooking equally. The smooth ceramic surface is ultra-easy to clean, and doesn’t need more than a few wipes with a damp cloth after each use. You will never need to waste your weekend scrubbing your hob.